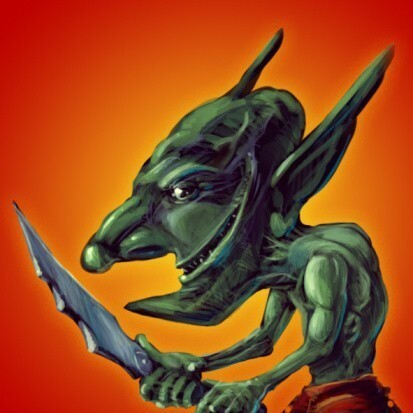 Goblins are a species with great variance as they occupied areas throughout the world over time. They evolved in many shapes and sizes and were known for their unbridled quest for prosperity and wealth. Goblins are magickal creatures who can command the magick of visibility & invisibility, telekinesis, mental influence & confusion, and detection of objects beyond barriers. They lived in frozen mountains to balmy jungles and they evolved and developed abilities specific to their geographic needs. Goblins as a species are always cunning, quick problem-solvers, wildly intelligent & creative, and are mystics beyond comparison. They are quite enigmatic and mysterious creatures who spend their time massing hoardes of gold, jewels, fineries, and luxuries of all kinds. The Michlin tribe of Goblins were located in Central Europe. They were 3'-4' in height, had pale green to dark green skin, and exaggerated facial features. They were trained as warriors from a young age and were known as formidable opponents with blades and hand-to-hand combat. They were a large tribe but would splinter into smaller groups that would travel great distances to seek treasure, gold, and luxuries. The hoardes of treasure they achieved funded their expeditions and their daily lives. The Michlin tribe was a tight-knit community who were formidable foes as they would take gold from any species around them; Humans, Dragons, Elves, Vampires, etc. They would hammer without hesitation until they got what they wanted. As spirit companions they help you get in touch with your supernatural & natural talents so you can use them to gain victory and success in any areas of your life. They inspire your wisdom, intelligence, and creativity so you are always a step ahead of those around you. They are magnificent problem-solvers who provide you precise advice for your future and ways to solve the problems you encounter to your best advantage. You will uncover many surprising and exciting qualities about yourself while seeing opportunities for prosperity, wealth, and success. The Michlin tribe Goblins are incredibly loyal and creative. Custom Conjure Courtwind Angel :: Protection, Security, Justice, Rectitude Master Service :: Brain & Mental Power Custom Conjuration Or Binding During Full Moon!